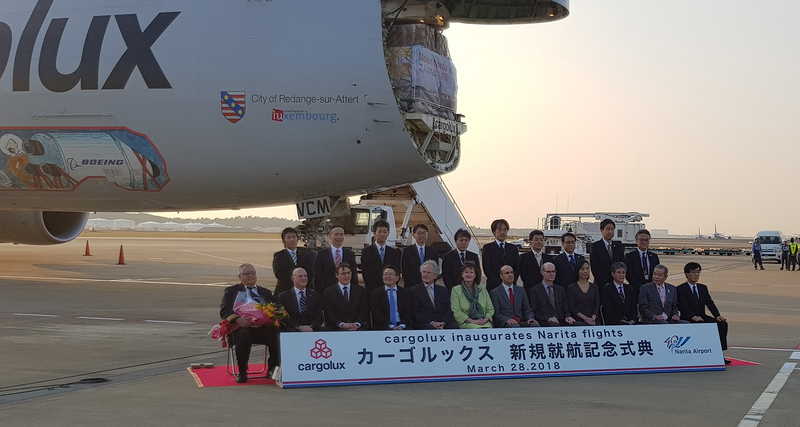 Luxembourg, 28 March 2018 – Today, Cargolux inaugurated a new weekly flight from Luxembourg Airport, to Narita International Airport in Japan in the scope of a cooperation agreement with Nippon Cargo Airlines (NCA) for code-share cargo flights between Luxembourg and Tokyo. Cargolux’s Boeing 747-8 freighter, registered LX-VCM, was warmly welcomed with the traditional water cannon salute upon arrival on Wednesday, followed by celebration events at Narita airport. During the ceremony, Richard Forson, Chief Executive Office of Cargolux, emphasized the importance of Japan in Cargolux’s network “Japan has long played an important role in Cargolux’s Far East network and we are looking forward to supporting Japan’s trade lanes to and from Europe”.